March 13th, 2005: What a wild week! Temperatures in the plus double digits took the snow down noticeably; then ferocious windstorms blew it around (and, as near as I can determine, did little damage), then it turned cold again, down to —19°. We got a total of about three inches of fresh snow, too. We were in Saskatoon Monday and Tuesday, and in Prince Albert on Friday, but had no problem with driving conditions. I am surprised to see that there are no lights on the new TV tower. For months now it has been sticking up into the air several hundred feet with nothing to mark it once it gets dark. The other towers, half a mile to the west, are well marked and I would think there would be an advisory for air traffic, but is that enough? It seems that running some lights up to the top would be a very simple matter. there was a good chance it was a taxicab. Next time you’re in the city, watch the taxis - see if you come to the same conclusion as I have. Once again, the Kelvington Legion is putting on Greenwater’s annual Fish Tournament. The date will be Sunday, March 27th, from one to three PM. Watch for posters. 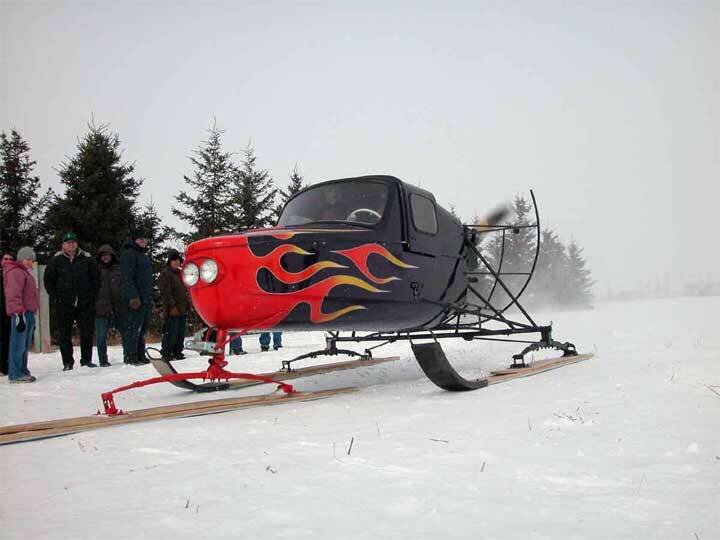 For the uninitiated, a snowplane is a vehicle that looks like most of an airplane but without wings and tail. The engine is mounted behind the cabin driving an airplane propeller and the whole thing is on either three or four skis. The engine can be anything from a six-cylinder Chev engine, to a Lycoming aircraft engine, a Tiger Moth airplane engine from the ‘thirties to a modern Subaru. Some drive the prop right off the crankshaft, others have an off-set v-belt drive which lets them mount the engine lower, for a lower center of gravity. None that I saw had any kind of braking system; when the machine slows down, you will see the driver’s door open, and his foot come out and dig into the snow. Usually Edd was there to lean against the front and bring it to a halt. When one approaches, it’s a good idea to move out of its path. It’s a bad idea to approach too closely from the back. Some snowplanes were commercially manufactured (Lorch, Fudge) in the days before snowmobiles but they were never a large-volume item. I think more were homemade than were factory-built. In their day they served a real need for winter transportation where cars couldn’t go. The rally was at V & S Service; there were about thirteen machines there but not all were running yet, so we had time for a coffee with Millers and Steadmans. When we went out, the machines, each home-made and original in design, were offering the public free rides. They would run to the east end of the quarter and back, and they were never short of passengers. I managed to wangle rides on two different snowplanes, and on a Super-Doo — built like a snowplane but driven by two tracks instead of a propeller. The snow on the field was soft and deep, so the machines were smooth, though noisy. I did meet Tom Santo, and had a brief but pleasant visit with him. He didn’t bring a machine up; apparently he is still working on it. 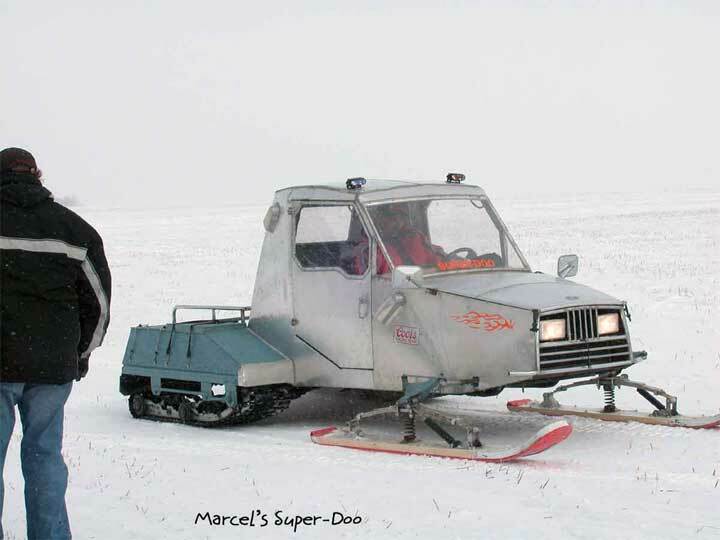 Edd tells me there is no formal snowplane organization, but each winter a bunch of enthusiasts get together by phone and pick a location for a rally, to compare machines and experiences. I had a wonderful time! Many thanks to Edd for informing me!